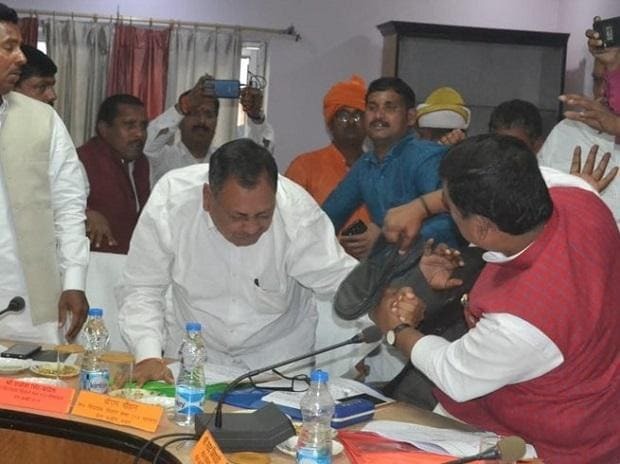 Two elected representatives of the ruling BJP came to blows during the district planning committee meeting on Wednesday evening, leaving other participants stunned and the party red-faced. The fight, caught on tape, took place during a meeting at the district collectorate in the presence of minister in charge of the district, Ashutosh Tandon. The opposition mocked the ruling party as tv channels carried video clips of the fracas in which an MP thrashed an MLA with his shoe. The Congress shared the clip on Twitter and said in Hindi, Presenting the entertainment for today, the Bharatiya Joot (shoe) Party. Samajwadi Party president Akhilesh Yadav also took a swipe on Twitter at the Bharatiya Janata Party which claims to be the world's most disciplined political party. The BJP's Uttar Pradesh president Mahendra Nath Pandey took serious cognisance of the fracas and has summoned both leaders to Lucknow. Sant Kabir Nagar MP Sharad Tripathi and Mehdawal MLA Rakesh Baghel got into an argument at the meeting over taking credit for a newly laid road. After a brief exchange of words, the MP got up from his seat and began thrashing the MLA with his shoe, as tv cameras recorded the episode. The MLA reacted, landing a few blows on Tripathi. A senior police official intervened to pacify the two and restore order. Meanwhile, Tandon, the state's medical education minister, left the place. Tripathi was apparently angry that his name was missing from the plaque marking the inauguration of the road in the district's Mehdawal area. I have taken serious cognisance of the incident and have summoned both of them to Lucknow. Disciplinary action will be taken as per party discipline," Pandey said. "The incident is 'ashobhniya' (indecent) and 'amaryadit' (undignified)," he added. SP president Akhilesh Yadav said on Twitter on Twitter that an MP and an MLA of the political party that claims to be the most disciplined respectfully exchanged blows. He used the Hindi term saadar aadaan pradaan for the exchange. While sharing the video clip on Twitter, Congress also put out a disclaimer. The act has been performed by experts. Please do not attempt this on anyone, it said. All India Congress Committee spokesperson Pranav Jha said violence is ingrained in the culture and ideology of the BJP and the RSS. Whenever confronted with questions that affect the common people and the country, they resort to violence instead of answering them, he said.